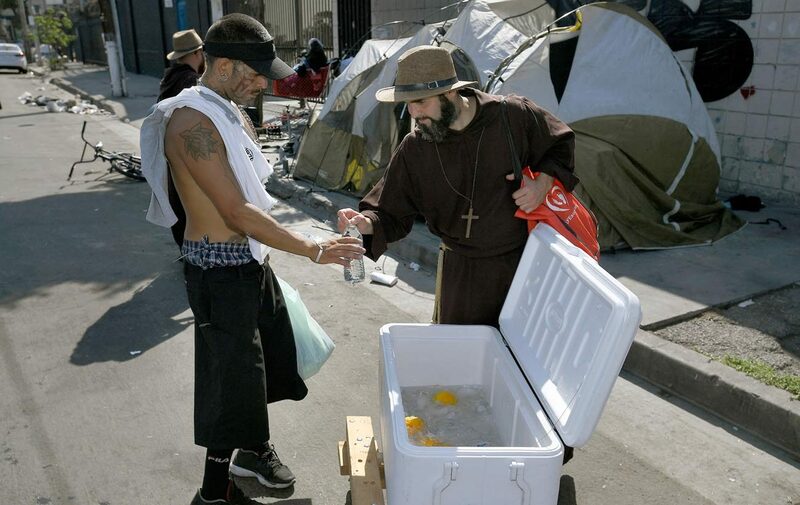 LOS ANGELES (CNS) — Friar Benjamin of the Most Holy Trinity walked down Towne Avenue in Skid Row, one hand wheeling an ice chest filled with oranges and bottled water, the other clutching plastic bags of peanut butter and ham and cheese sandwiches, chips and fruit snacks. Dressed in a full habit, a straw hat and brown flip-flops, Friar Benjamin, 42, along with three other friars, one religious sister and three volunteers, shouted, “Cold water! Free food!” as they made their way along the tent-lined streets in 90-degree heat. They moved slowly, taking time to talk with people about their lives and to ask if they need a prayer. Tyrone Tankins, who has lived on Skid Row for eight months, asked them to pray for his sick grandmother. Even though he survived cancer and a gunshot wound, he said, it’s his grandmother who needs help. “I’m worried about her,” he said. The group gathered in a circle, joined hands with Tankins and prayed with him. A woman requested a prayer for her car to be fixed. A man asked to sing for them. By the time they finished circling the block they had given away all their food and water, even the ice from the cooler. Together with another team of friars, nuns and volunteers, which walked a different block, they distributed 400 sandwiches to 200 homeless people in a single Saturday afternoon. Friar Benjamin is a member of the Friars and Sisters of the Poor Jesus, a religious order founded in Brazil with the mission to minister to the neediest and most marginalized members of society. After Los Angeles Archbishop Jose H. Gomez invited the order to the city earlier this year, a band of four friars and four sisters have set out for Skid Row every weekend, in hopes that free sandwiches and bottled water will be the first step in lifting the city’s growing homeless population out of poverty and despair. The religious order was founded in 2001 by Brazilian Father Gilson Sobreiro. Troubled by the violence, gang activity, drug addiction and poverty that he saw in Sao Paulo, Father Sobreiro rented a house where addicted youths could live and recover. From this, the order spread to 12 countries, including Paraguay, Argentina, Nicaragua, El Salvador, France and Canada. In 2012, the first members arrived in Kansas City, Missouri. In Los Angeles, that means Skid Row, where more than 4,000 of Los Angeles County’s nearly 53,000 homeless people live, according to the Los Angeles Homeless Services Authority. Father Brian Nunes, the archbishop’s priest secretary, said the decision to call on the religious order was a direct response to the city’s growing homelessness crisis. “So many people are working on the issue of homelessness, but Archbishop Gomez wanted to make sure they’re cared for in a spiritual way,” he said. Friar Benjamin agreed that spirituality is at the core of their mission. While the religious order is not the only one ministering on the streets of Los Angeles, it is perhaps the most visible. Sister Maria Carlos-Valdez, archdiocesan vicar for women religious, said that groups such as Lovers of the Holy Cross, Mary Queen of Heaven Missionaries, the Religious Sisters of Charity and the sisters at the Good Shepherd Shelter also minister to the city’s homeless people, but often do so in lay clothing, so they aren’t always recognized as religious. To better serve poor people, the friars and sisters strive to live in poverty themselves. It means having minimal personal possessions — a few changes of clothes and no cellphones — sleeping on the floor and eating only what has been donated. To raise money, they make rosaries and other crafts that they sell in local parishes. “Especially now, in our world, people think that to be happy you have to have and have and have,” said Sister Maria Goretti of the Spiritual Infancy, a member of the community. Such a life of simplicity rooted in poverty drew Sister Maria to the order. She first encountered the order during a retreat as a teenager in Brazil. She was struck by how young its members were and the joy they radiated, making her want to learn more. They didn’t have any of the material possessions she had considered the key to happiness, yet they were joyful. So at age 15, Sister Maria, who is now 25, joined the order. She ministered in Brazil, Paraguay and Kansas City before coming to Los Angeles. Claudia Pina, a volunteer from La Habra, California, has been making and distributing sandwiches with the order since February. One Saturday in August she brought her 8-year-old son, who not only put together bags of food, but also wheeled them on a dolly around Skid Row. The experience, she said, has been important to his faith formation. “It allows him to see what’s taught in the Bible firsthand and to live it,” she said. While food distribution has been the centerpiece of the order’s work, members are hoping to do more. Eventually, Friar Benjamin said, they would like to open a house so that homeless people can live with them and escape Skid Row. Opening a house would allow the religious order to reach even more people, but Sister Maria said that numbers are not their focus. Kandil writes for Angelus, the online news outlet of the Archdiocese of Los Angeles.